In a season when most movies spend inordinate amounts of money creating adolescent thrill rides, a film that delivers a pep talk to the geezer crowd almost immediately qualifies as worthy — if only from a counter-programming point of view. Before you knock over your Metamucil, know that I’m old enough to disqualify myself from accusations of ageism. If I’m not a full-fledged geezer, I’m certainly a geezer in training. Let me be even more specific. I’m older than both Bill Nighy and Tom Wilkinson, who — in The Best Exotic Marigold Hotel — play characters who have stumbled into a post-retirement twilight zone. A terrific British ensemble cast — Judi Dench and Maggie Smith join Nighy and Wilkinson — helps overcome some of the sentiment that inevitably bubbles through a movie that insists on telling us that it’s never too late for ... well ... something. Maybe romance. If not romance, maybe a bargain-priced hip replacement. And if not that, perhaps a swan song roll in the hay. Director John Madden — who can hit wonderfully right notes (Shakespeare in Love) as well as obvious clinkers (Captain Corelli’s Mandolin) — follows a group of seven Brits to a shabby hotel in Jaipur, India. It’s instructive to compare Madden’s movie to last week’s Darling Companion, another movie populated by characters in their ’60s. I wouldn’t call Madden’s movie a triumph, but at least it springs from more than marriage ennui among the affluent, a prime focus in director Lawrence Kasdan’s movie. The characters in The Best Exotic Marigold Hotel face real problems of aging: diminished income, ravaged nest eggs, ill health and loneliness. Thats’ not to say that Madden’s movie wouldn’t have been better had it not treated the woes of aging quite so dutifully, almost as if compiling a checklist for a late-life self-help book. Working from a script by Ol Parker, who adapted a novel by Deborah Moggach, Madden puts his capable cast to best use when it comes to delivering sharp dialogue or sharing tender moments. He also understands that India offers a rich and colorful backdrop for a story in which each character overcomes at least one problem. 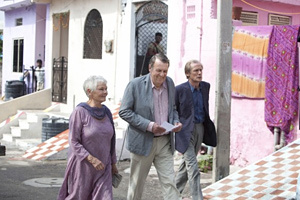 Examples: Wilkinson’s Graham, a sad and emotionally burdened gay man, tries to rectify a mistake he made in his youth; Dench’s character is dealing with the travails of recent widowhood; Smith plays a bigoted woman who has come to Jaipur as a medical tourist. She needs a hip replacement. Living in India has its difficulties. One couple exemplifies opposing responses to a land of heat, spice, poverty, beauty and exuberant street life: Dogulas (Nighy) learns to delight in the city’s pleasures. By way of contrast, his embittered wife (Penelope Wilton) complains about the food and refuses to leave her hotel room. Libidos don’t always go gently into the good night of old age. Norman, the aptly named Ronald Pickup, is looking for a last fling. Celia Imrie would like to find a rich husband. The cheerfully chaotic young man (Dev Patel) who runs the hotel is prone to exaggerating the splendor of its amenities, which mostly are non-existent. Patel’s Sonny Kapoor has his own troubles. He’s romantically involved with a young woman (Tena Desae) who works at a call center. Sonny’s mom (Lillete Dubey) opposes her son’s relationship with Desae’s character, and wants to sell the hotel, which she views as both a social embarrassment and a financial burden. There’s no faulting any of the performances, and there’s enough wit and humanity in the screenplay to keep The Best Exotic Marigold Hotel from turning smarmy. And if — in the end — it’s a bit of a fantasy for the over 60 crowd ... well ... not everyone wants to groove on The Avengers.